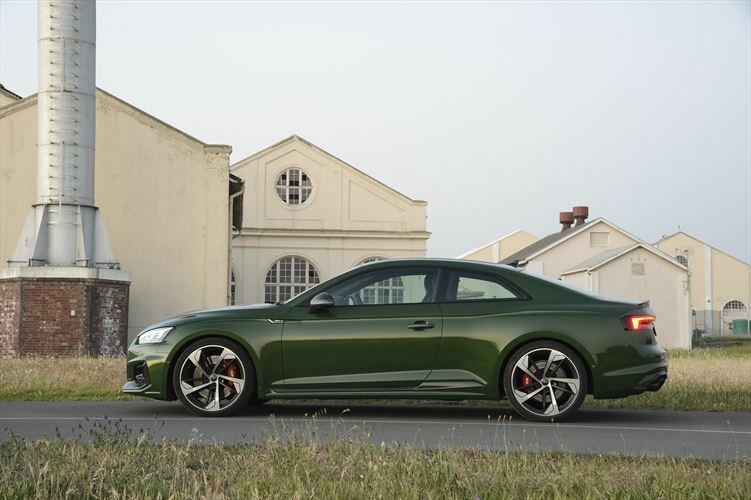 This week was an exhilarating test, in the Audi RS 5. The RS badge always stirs the adrenalin, and you know it’s going to be a seat of the pants kind of day. That is of course, if you are a performance car enthusiast , as you could trundle along in traffic? That would be no fun, as these cars are built for performance, and the Audi RS5 does that in spades. 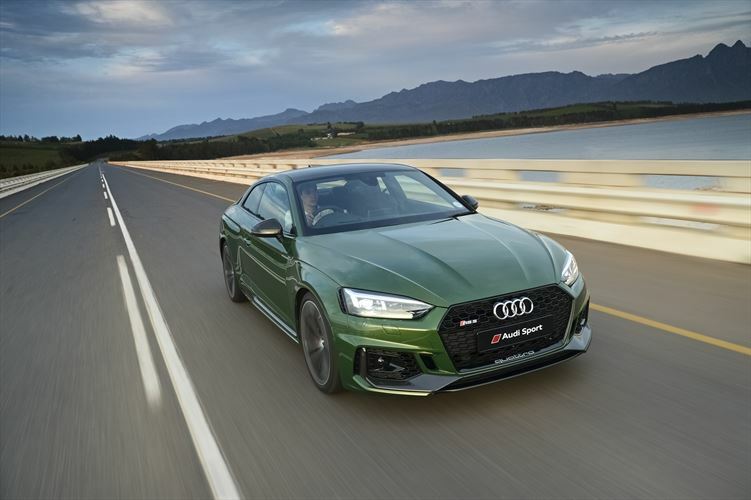 It looks fast, with its sportback shape, to the ringed grille that shouts mostly, ‘’ please move out of the way’’ Available for the first time ever in Sportback guise, the new Audi RS 5 Sportback is a brand new offering in the Audi Sport portfolio without a direct competitor. An RS-specific diffuser insert, RS exhaust system with oval tailpipes and fixed spoiler lip give the rear end its sportiness. The interior is built for five people, but will comfortably sit four. It has five doors, including the boot, and space is pretty good. The interior is finished in black, with fineRS embossed Nappa leather seats in honeycomb pattern. The steering wheel, also RS embossed, is a multi fuction one, with all the knobs and buttons you need to hand, and the gear change paddles. The boot seems huge, but is 480 L, and fold down options impressively increase it to 1300 L.
Special RS information displays in the Audi virtual cockpit provide information on tyre pressure, torque and G forces. In manual mode, the shift light display prompts the driver to shift up once the engine speed threshold is reached. In manual mode, the shift light display prompts the driver to shift up once the engine speed threshold is reached. The racing seats are snug, but not overly so, and you feel in control of the car at all times. 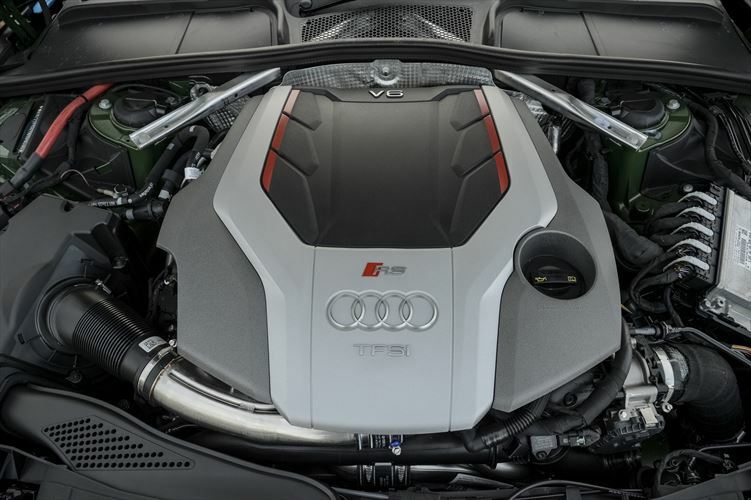 The RS 5 Sportback shares its 2.9 TFSI V6 twin turbo engine with its Coupé sibling as well as the RS 4 Avant, with a power output of 331 kW and a maximum torque of 600 Nm, which is deployed throughout a wide speed range from 1,900 to 5,000 rpm. 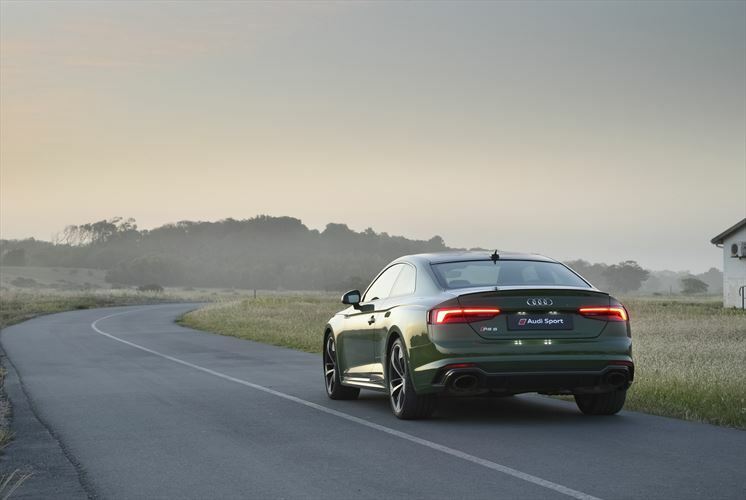 The Audi RS 5 Sportback accelerates from 0 to 100 km/h in 3.9 seconds. This is blisteringly fast, and things could go wrong very quickly. The RS does not feel heavy at all, and my ideal was not with paddles, but in dynamic mode with sport activated. This gave me the ideal rev range, and the car seemed to perform optimally. 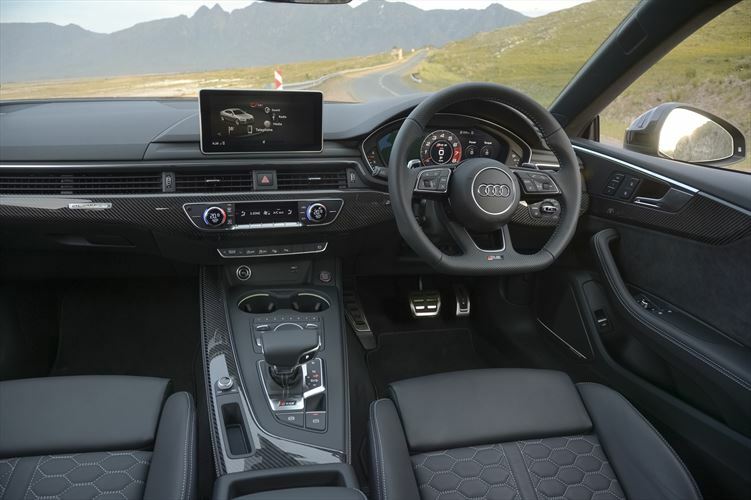 The power of the 2.9 TFSI is transferred to the quattro permanent all-wheel drive with centre differential via an eight-speed tiptronic transmission with optimized shift times that is specially tuned to sporty driving. The five-link design on the front and rear axles allows for substantially enhanced comfort, even in the sportiest of driving modes. With the standard RS sports suspension, the RS 5 Sportback is seven millimetres lower than the Audi S5 Sportback. The RS 5 Sportback, like the RS 4 Avant, is available in South Africa with an extensive range of standard equipment. 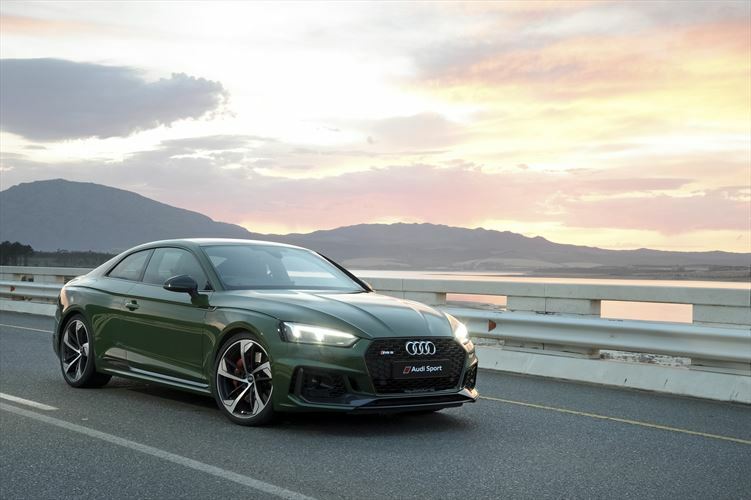 This includes LED headlights and LED rear lights, the RS sports suspension, 20-inch aluminium forged alloy wheels, the RS exhaust system and the Audi drive select dynamic handling system. For the interior, RS sports seats in Fine Nappa leather with diamond stitching and lumbar support, black headlining, a flat-bottomed RS multifunction sports steering wheel and stainless steel pedals are all available in its standard trim. Other features such as automatic climate control, MMI Navigation Plus with Audi virtual cockpit, Audi connect, Bang & Olufsen sound system with 3D sound and Audi smartphone interface enabling Apple CarPlay are also included. The assistance systems Audi pre-sense rear, Audi pre-sense basic, Audi side assist, parking system plus and rear-view camera system supplement the extensive standard features. It is a good all round package. It’s worth every cent, and for me I would probably go for this size of car, as I prefer 5 doors, and your luggage is not in a Thule on the roof, which would spoil the image. It is unashamedly a performance car, and frankly, I love it.